Den Ishu is no stranger to the underground world of dance music, having previously released on labels such as Desolat and Noir. He appeared in collaboration with Superlounge a few months back on Supernature with the excellent ‘Get Back’ EP so a full release just made sense and this time he presents us with a break from his previous trademark sounds. 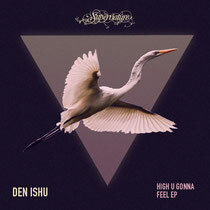 ‘High U Gonna Feel’ is the jewel in the crown here - slow in pace but very chunky in nature, Den works the vocal sample and strings in a way that makes this track instantly recognisable. ‘Your Experience’ is no less engaging, and thanks to his cleverly programmed bassline it works well. Finally, ‘Say The Word’ proves that Den is no one trick pony, he can shuffle around the tempos and melodies very easily. Avatism (Dumb Unit, Souvenir) provides a very different interpretation of ‘High U Gonna Feel’ that will surely please those who like it deep. Out 14th March.